before half their days are spent. In Matthew 5:43-48, part of the Sermon on the Mount, Jesus commands his followers to love their enemies and to pray for their persecutors. Those instructions contradict the psalm and the designated portion of the Book of Esther. In the Book of Esther Haman meets his grisly end and King Ahasuerus grants permission to Mordecai and Queen Esther to revoked the first royal edict and order anything (in his name) they deem appropriate. Ahasuerus remains a figure through whom others govern. 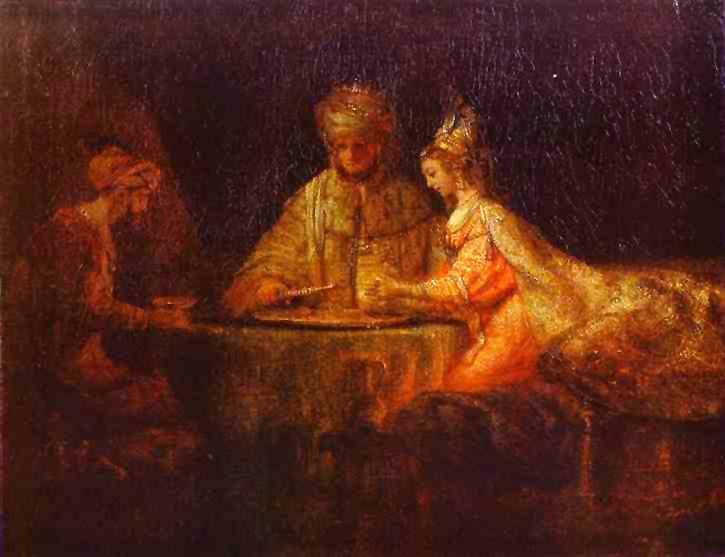 The monarch orders the execution of Haman and his sons and gives his property to Queen Esther. She and Mordecai write the second royal edict (as contained in Chapter E, as The New American Bible labels it) in the name of Ahasuerus. They authorize Jews living in the Persian Empire to attack their (the Jews’) enemies. Mordecai receives special honors, and, throughout the empire, Jews rejoice and their enemies do not. If the man who testified is a false witness, if he has testified falsely against his fellow, you shall do to him as he schemed to do to his fellow. Thus you will sweep out evil from your midst; others will hear and be afraid, and such evil things will not again be done in your midst. Nor must you show pity; life for life, eye for eye, tooth for tooth, hand for hand, foot for foot. Nevertheless, there is a difference between justice and revenge. I grasp the punishment of Haman yet wonder about the bloodbath reported subsequently in the Book of Esther. “An eye for an eye and a tooth for a tooth” leaves the world blind and toothless in time. I, as a Christian, read the Bible through what the late Donald Armentrout called the “Gospel glasses.” The four canonical Gospels contextualize the rest of the Bible for me. The ethics of Jesus therefore override contradictory texts in my mind. I am still working on loving my enemies as I understand the distinction between justice and revenge on one hand and revenge and a rescue operation on the other. Some people will not cease from oppressing because others appeal to their consciences, which might not exist. Nevertheless, is even necessary violence something to celebrate? Haman’s plot to kill the Jews fails in Esther 7. Haman dies by impaling–the means of death he had planned for Mordecai. King Ahasuerus bestows Haman’s property upon Queen Esther and grants Mordecai and Esther the authority to countermand the order to kill the Jews. Then, in Chapter 9, Jews massacre their enemies, numbered in the tens of thousands. 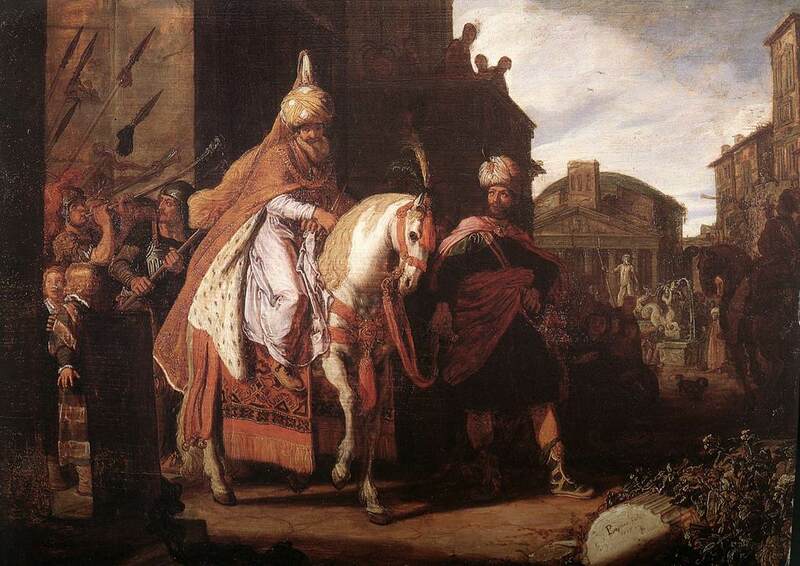 Ahasuerus becomes a monarch who does not sanction genocide and Mordecai receives a major promotion. In Revelation much rejoicing in Heaven follows the fall of Rome, for God has avenged those whom the empire had victimized. Many of psalms contain prayers for vindication. Esther 9 and Revelation 19 reflect the same desire. I recall also an episode of Hunter (1984-1991) I watched on DVD recently. A stereotypically White trash criminal, upon learning of the death of his wife, prays in one scene for the aid of Jesus in killing the man who took her life. The desire for vindication is a natural and predictable one. Indeed, I know it well. Yet I know also that there would be less violence and more peace in the world if fewer people sought vindication and left that matter to God. What is your petition, Queen Esther? It shall be granted you. And what is your request? Even to the half of my kingdom, it shall be fulfilled. If I have won your favor, O king, and if it pleases the king, let my life be given me– that is my petition– and the lives of my people– that is my request. For we have been sold, I and my people, to be destroyed, to be killed, and to be annihilated. If we had been sold merely as slaves, men and women, I would have held my peace; but no enemy can compensate for this damage to the king. Who is he, and where is he, who has presumed to do this?” Esther said, “A foe and enemy, this wicked Haman! Then Haman was terrified before the king and the queen. Look, the very gallows that Haman has prepared for Mordecai, whose word saved the king, stands at Haman’s house, fifty cubits high. So they hanged Haman on the gallows that he had prepared for Mordecai. Then the anger of the king abated. Mordecai recorded these things, and sent letters to all the Jews who were in all the provinces of King Ahasuerus, both near and far, enjoining them that they should keep the fourteenth day of the month Adar and also the fifteenth day of the same month, year by year, as the days on which the Jews gained relief from their enemies, and as the month that had been turned for them from sorrow into gladness and from mourning into a holiday; that they should make them days of feasting and gladness, days for sending gifts of food to one another and presents to the poor. If only we had meat to eat! We remember the fish we used to eat in Egypt for nothing, the cucumbers, the melons, the leeks, the onions, and the garlic; but now our strength is dried up, and there is nothing at all but this manna to look at. Why have you treated your servant so badly? Why have I not found favor in your sight, that you lay the burden of all this people on me? Did I conceive all this people? Did I give birth to them, that you should say to me, “Carry them in your bosom, as a nurse carries a sucking child,” to the land that you promised on oath to their ancestors? Where am I to get meat to give to all this people? For they come weeping to me and say, “Give us meat to eat!” I am not able to carry all this people alone, for they are too heavy for me. If this is the way you are going to treat me, put me to death at once–if I have found favor in your sight–and do not let me see my misery. Gather for me seventy of the elders of Israel, whom you know to be the elders of the people and officers over them; bring them to the tent of meeting, and have them take their place there with you. Eldad and Medad are prophesying in the camp. My lord Moses, stop them! Are you jealous for my sake? Would that all the LORD’s people were prophets, and that the LORD would put his spirit on them! cleanse me from my secret faults? Is anyone among you in trouble? Let him pray. Is anyone in good heart? Let him sing praises. Is one of you ill? Let him send for the elders of the church to pray over him and anoint him with oil in the name of the Lord; the prayer offered in faith will heal the sick man, the Lord will restore him to health, and if he has committed sins they will be forgiven. Therefore confess your sins to one another, and pray for one another, that you may be healed. A good man’s prayer is very powerful and effective. Elijah was a man just like us; yet when he prayed fervently that there should be no rain, the land had no rain for three and a half years; when he prayed again, the rain poured down and the land bore crops once more. My friends, if one of you strays from the truth and another succeeds in bringing him back, you may be sure of this: the one who brings a sinner back from his erring ways will be rescuing a soul from death and cancelling a multitude of sins. If anyone causes the downfall of one of these little ones who believe, it would be better for him to be thrown into the sea with a millstone around his neck. If your hand causes your downfall, cut if off; it is better for you to enter into life maimed than to keep both hands and go to hell, to the unquenchable fire. If your foot causes your downfall, cut if off; it is better to enter into life crippled than to keep both your feet and be thrown into hell. And if your eye causes your downfall, tear it out; it is better to enter into the kingdom of God with one eye than to keep both eyes and be thrown into hell, where the devouring worm never dies and the fire is never quenched. Salt is good; but if the salt loses its saltness, how will you season it? You must have salt within yourselves, and be at peace with one another. We are responsible for ourselves and for others. That is the theme which unifies the readings for Proper 21, Year B. In the meantime, Moses complained to God that the burden of leadership was too heavy for him to bear alone. So he got a council of seventy elders to help. One moral of the story, I suppose, is to be careful about one’s complaints to God. James and Jesus, the latter in Mark, remind us in positive and negative terms of the principle that we are responsible for each other spiritually. And, in Mark, we read some hyperbolic language about removing one’s own stumbling blocks. Our Lord did not advocate mutilation. Rather, the principle is simple and not unique to Mark 9: Whatever stands between you and God, get rid of it. Besides, how can you avoid being a stumbling block to others if you are so severely spiritually errant? Can the blind lead the blind to safety? What we do affects others. What we do not do affects others. May we act responsible, whether alone or collectively.